_ _Meat and potatoes remind me unequivocally of England (where I’ve been twice, no big deal). “But Anna,” you say, “shouldn’t something more like fish and chips remind you unequivocally of England?” Well yes, but that doesn’t help me in regards to this post, so stop being such a smart-arse. When I was in high school we took two class trips to that jolly island and although I absolutely loved my time there, I got the distinct feeling that the country as a whole wasn’t sad to see me go… I thought my constant impressions of Tiny Tim and/or Oliver Twist and/or anyone speaking with a Cockney accent were far more hilarious than they were. I still do. _ _ In any case, these are the perfect side for a nice steak… ideally some Kobe beef, not the Walmart filets which are all I can afford. Don’t judge me for shopping at Walmart, please. But even with a kind-of-terrible, definitely-not-organic steak, I still find myself saying: “please sir, I want some more!” …*tap tap* is this thing on? 1. In a small sauce pan heat the soy sauce with the seasonings and slowly whisk in the butter until it’s all combined. 2. 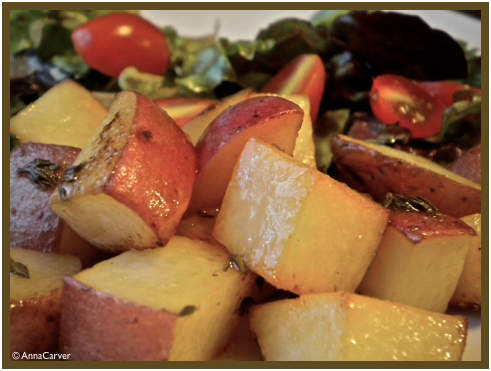 In a large bowl, pour the sauce over the cubed potatoes and mix. Let it sit and soak for a couple minutes. 3. Spread the potatoes in a single layer on a foil-lined baking sheet. Don’t pour the extra sauce over the potatoes because it will burn. Bake for 30-40 minutes (with the oven fan on HIGH) or until the potatoes are tender and the soy sauce has slightly caramelized. Serve with steak and salad! Next Next post: Get Dressed!